Aird Steading Cottage stands as the only cottage on the Craignish Peninsula with sea views of Loch Craignish and the Sound of Jura, and is a 5 star spacious, luxury cottage for 2. This cottage offers a lounge with a wood burning stove, kitchen / diner and bathroom with Jacuzzi and fluffy bathrobes. A large garden lies in front of the sitting room windows, with unique views which can be enjoyed from a variety of garden furniture. An excellent week in Argyll. We spent a week lodging at Aird farm steading. The cottage itself is generously proportioned for two people, very well equipped, clean, tidy and obviously well maintained. It was a wet week with a storm blowing in from the west and the cottage provided an excellent shelter from which to view some spectacular weather. Argyll, in general, is always a delight to visit and Aird proved to be an ideal base for our explorations of the local area. The owners are generous and welcoming and work hard to provide a great holiday home. Well equipped cottage. Friendly welcome then left alone to enjoy the stay. Whole area is well worth exploring. Cosy and comfortable, a perfect retreat. We thoroughly enjoyed our week staying in the well appointed and comfortable Aird Steading Cottage. The amazing views and remote location were just what we were after, and The Cottage didn't disappoint. We were particularly impressed with the well equipped kitchen, which we made full use of. The efficient and effective central heating and hot water system never left us wanting, and the washing machine, tumble dryer and dishwasher were all spotlessly clean and in excellent condition. The king size bed was extremely comfortable, and the super high quality bed linen made for some lovely decadent lie-ins! The wine, homemade fruit loaf and fresh eggs waiting for us on arrival were a nice touch, and very much appreciated. We had a wonderful week at Aird Steading Cottage and it was everything we expected and more. What a great place with natural beauty all around, islands, seascapes and farm animals, birds and fields. It was awesome. The cottage was all it said it would be and more... It was warm and cosy, everything we needed for self catering was available. The jacuzzi bath was fantastic. There was a great welcome on arrival along with fresh farm eggs, a newly baked fruit loaf, flowers and wine! We would definitely go back to enjoy the peace and being away from it all. The cottage is a four mile drive, one way to the Ardfern Village shop. We thoroughly enjoyed our stay at Arid Farm, its a very comfortable & well equipped Cottage with wonderful views all around the property. Great location for local walking & site seeing further afield. Lots of wild life to see as well as being surrounded by farm animals. The cottage was lovely as was the location. The Campbell family were very welcoming and helpful, advising us where to see the local wildlife. A holiday to fondly remember. Our new favourite place in Scotland. Just spent a wonderful week at Arid Steading Cottage. We needed to recharge and reboot and thats exactlly what we did. The cottage was spotless and the facilities in the cottage were all first class, well deserving of the 5 star rating. Alison & Malcam were the perfect hosts they made us feel very welcome and at home but at the same time giving us the space we needed. The views from the cottage were wonderful and we were extremely lucky with the weather giving us some wonderful sunsets. We would highly recomend this cottage and we will return back again. Beautiful views and all the comforts. 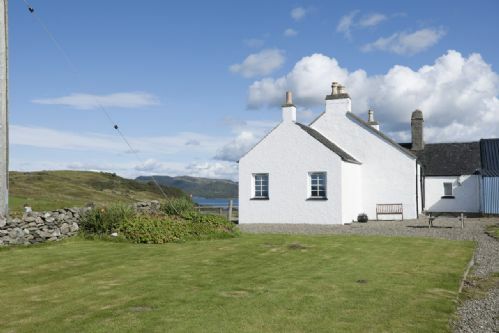 AIrds Farm Steading cottage is in a lovely location, fabulous views of the sea either side. Cottage itself is very well appointed with great personal touches. Even enjoyed my daily duties of opening and closing the farm gates said we went out touring wider Argyll area. Great for some relaxing chill out days too. We had a lovely week at Aird Steading Cottage. The cottage itself is absolutely lovely, with everything you could possibly need for your stay. The hosts, Malcolm & Alison could not be more helpful - even coming out at 10.00 at night to rescue a Tawny Owl trapped in a barn! The views (and especially the sunsets) from the cottage are outstanding. Aird Steading Cottage was welcoming, warm, comfortable and spotlessly clean. It also had a very well equipped kitchen. It had everything you could wish for to feel like a home from home. The cottage is beautifully situated with views of the sea on both sides of the peninsula and of the hills and islands around. We enjoyed watching the cows, calves, sheep, lambs and horses nearby. Alison had left flowers, homemade cake, fresh eggs from her hens and a bottle of wine to welcome us. Thank you Alison and Malcolm for a great stay. Felt at home straightaway. Warm and welcoming. Prominent position at end of Craignish Peninsula. Looks to sea lochs both sides. Wonderful sunsets behind Jura and Scarba. Silence apart from birds, sheep and cattle. Friendly farmers who look after the property close by. We really enjoyed our stay, we were welcomed with homemade fruit loaf, fresh eggs from the hens on the farm(which were both delicious! )and a bottle of wine. The cottage was very well equipped and spotlessly clean. The view from the cottage is stunning and ever changing. The only downside is the road to get up to the cottage is very uneven and bumpy but this is just a small negative and we would highly recommend the cottage to everyone. Aird Steading Cottage is a very comfortable and well provisioned property in a lovely location. There is everything you could need in the cottage and you have great views, walking and wildlife on your doorstep. We thoroughly enjoyed our week here. The owners are also freindly and helpful. A beautiful cottage in a wonderful setting at the end of a peninsular with lochs to both sides as seen from the cottage windows or inviting garden. The cottage is spacious, perfectly equipped and wonderfully warm and cosy. Together with lovely hosts and an environment ripe for exploration and adventure Aird Steading presented us with a superb holiday. This is a great cottage in a great location, ideal place to escape from it all. Already trying to plan our next visit. Lovely cottage in a very peaceful rural setting. Very friendly and helpful owners. Wine and fruit loaf very much appreciated. Everything you could need for a relaxing holiday. A beautiful place to stay in a stunning landscape. The view towards Jura and Scarba made for the most fantastic sunsets. This is a very good cottage large comfortable and cosy just like the website with everything you could want. Malcolm and Alison made us very welcome with wine fresh farm eggs and cake. The location is spectacular with fantastic views out to sea. A very pleasant and relaxing break. From the moment you arrive at Aird Steading you are made very welcome and comfortable by Alison and Malcolm by their eye to detail. The cottage is very warm, clean and comfortable. There are welcome gifts including home made cake. Also eggs from the farm chickens. Helpful folders of 'things to do and see' in the area. If wanted, you can always ask for advice on the locality, for example, routes to walk. The scenery is stunning. Sea and lochs to either side. Wonderful sunsets. There are beautiful gardens to visit and Kilmartin has a host of prehistoric sites. Magic. What a stunning location and such a peaceful place to unwind! It was also a real joy seeing the calves and lambs! Perfect.